The aroma of coffee and muffins floats through the lobby of Wheaton Bible Church on this rainy Sunday morning. People are just beginning to arrive for the first service, but already Gathering Grounds café is busy. Several parking attendants sit around one of the tables before heading out to direct traffic in the soon-to-be-busy lot. 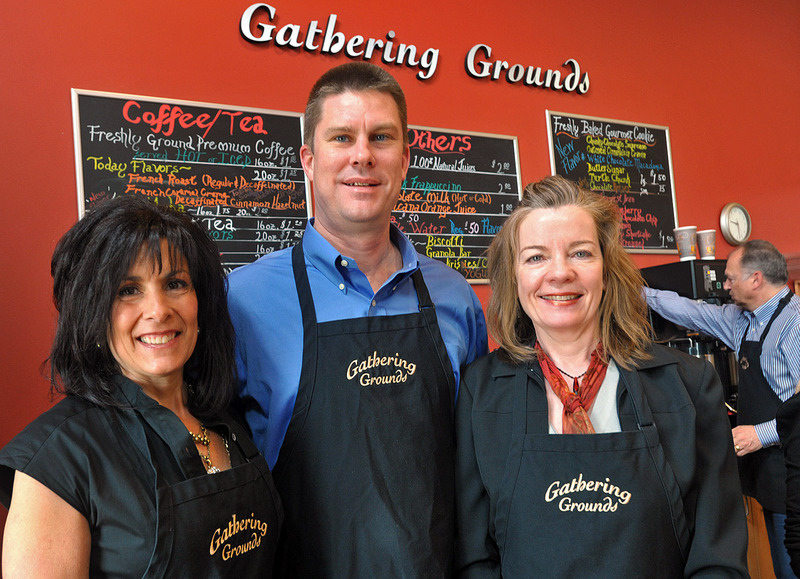 Mari Bartilotta, Scott Kremers, and Colleen Mathe, Gathering Grounds' volunteer staff leaders. At another table a woman shows her friend the latest grandbaby pictures, and nearby a man sips coffee while reading his Bible. 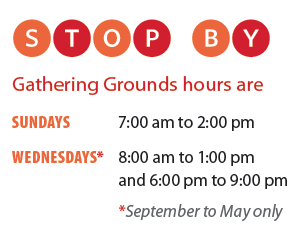 Gathering Grounds is one of the first areas visitors notice as they walk through the main doors of the church; a cozy, friendly place that welcomes people to sit awhile, have a cup of coffee or tea, meet an old friend, or make a new one. The church staff knew they wanted a café ministry in the new building but didn’t know what it would look like or who would lead it. Then one evening, Bob and Mari Bartilotta were having dinner with Pastor Bugh and his wife. Mari, being creative (and possessing great culinary skill), had many ideas for a café, and she shared those with the pastor. Meanwhile, Jeff Erickson (Director of Operations and Planning) was working with Colleen Mathe, who had expressed a desire to use her gifts of service and leadership in this ministry. Because both women were interested, they were asked to meet to coordinate ideas. Mari and Colleen didn’t know each other, and that first meeting was a reluctant one. The women are very different personalities, and at first, the idea of working together didn’t seem inviting to either one of them. But the Lord gives us different gifts and personalities for a purpose—because sometimes it is the differences that make us work so well together. In Mari and Colleen’s case, that’s exactly what happened. Mari oversees the menu and decorating details to create a welcoming atmosphere. Colleen works with and schedules the volunteers. Together they support the volunteers through training, encouragement, and filling in when someone is absent. In the process, they have become close friends. A ministry this size takes more than two people, however. David Narup is in charge of ordering the coffee from Papa Nicholas, and Scott Kremers does the never-ending Costco runs. Bunny Hamilton from Colleen’s Confections generously donates all the candy and chocolate-covered pretzels. In addition, 55 volunteer staff members serve in Gathering Grounds. But Gathering Grounds is more than just a place to satisfy your coffee cravings. 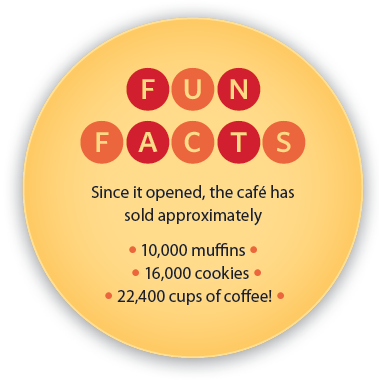 The café has developed into a three-pronged ministry. ONE: A unique service opportunity for volunteers. The staff is large in size, but the men and women—including volunteers from our English- and Spanish speaking congregations— have formed a close-knit team. Gathering Grounds also provides a service opportunity for some who haven’t served in a church before. They might be a little intimidated about taking that first step, and serving a cup of coffee is a good start. TWO: A unique place for people to minister to one another. But others wander over to the café because they are lonely and need a listening ear. The first day Gathering Grounds was open, Mari noticed a lady who looked lost. She began a conversation with her and learned that this was the first Sunday the lady had visited the church. Mari was able to answer some of the lady’s questions and later introduce her to Pastor Bugh, who had stopped by to see how things were going. The lady began coming to church and trusted Christ as her Savior. You never know how God might use a simple word of welcome when someone stops by at the café. THREE: A unique way to share with other WBC ministries. The Gathering Grounds has never had a profit goal; however, they have been blessed and able to share with other ministries. The first year, the café donated $6,000 to our Puente del Pueblo ministry. Last year the café donated $8,000 to WBC’s AIDS initiative in Kenya. All three areas of ministry have far-reaching effects. club on Wednesday), you’d like a chocolate-covered pretzel. So gather round in the Gathering Grounds. Linda Weddle, a writer and curriculum designer for Awans Clubs, is the author of a number of books for parents and children. This entry was posted on June 5, 2011 by Wheaton Bible Church in Summer 2011 and tagged Bob Bartilotta, Bunny Hamilto, coffee, Colleen Mathe, Colleen's Confections, community, cookies, Costco, David Narup, gathering, gathering grounds, grounds, hours, jeff erickson, mari bartilotta, muffins, Papa Nicholas, scott kremers, service, volunteer.